Remember the beginning of the 2009/10 season? Remember how Milan fans were pessimistic and the most defeatist ones were predicting a relegation fight? Milan had an old, slow midfield, an average and inconsistent strike force, embarrassing fullbacks and a non-coach in charge. Many will say it's beyond them how Leonardo managed to achieve Champions League qualification with his limited knowledge and the club's limited resources. But I know. I'll tell you how. One word: Ronaldinho. Perhaps I should have started this article with an apology to all those who celebrated Ronaldinho's departure as if we had won a title on that day. I for one was glad to see him go. With a good coach, a more balanced and dynamic midfield approach and the new personnel in attack, we had no use for a static, chronically unmotivated player like the Brazilian. But one year earlier, this wasn't the case. The first couple of games saw a disjointed Milan with no gameplan, no character and no identity. Leonardo experimented with a few formations but none seemed to work. 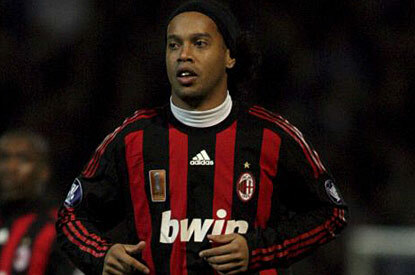 Then he decided, with approval from Berlusconi, to build a team around Ronaldinho, placing him in his preferred position on the left side of an attacking trio. The switch saw Pato get pushed away from goal, the midfield was exposed and games quickly turned into chaos when opponents attacked with pace. And you know what? It worked. No matter how naive the tactical setup was, it did the job. Saying Leonardo's gameplan was simplistic is generous - Milan's football philosophy was as follows: pass the ball to Ronaldinho, Ronaldinho dribbles to the right, crosses the ball for Borriello and Pato - and they score. The defense is left to its own devices, the midfield veterans are frustrated and often outnumbered. And it worked. Ronaldinho lacked work ethic, rarely defended with any diligence and was caught doing things professional football players usually don't do (publicly). Ronaldinho also made a massive contribution of 12 goals and 14 assists in the league which pushed an utterly average Milan side straight into the Champions League. While he wasn't nearly as dynamic and dangerous as in his heyday, he was usually assured in possession and his ever-threatening flashes of brilliance forced the opposition to allocate two players to him, thus relieving some of that pressure Milan endured due to the irresponsible tactical approach. Now let's look at some of the effects of his efforts. In August 2010, Berlusconi came home with two shiny new toys for the kids - Ibrahimovic and Robinho. While Robinho's addition was welcome, the real star of the transfer window was clearly Zlatan - a proven winner and a guarantee of victory, he immediately stated his ambition of finally adding the CL trophy to his collection. Now for the point of this paragraph - had Ronaldinho's Milan not achieved that third place in the standings, Zlatan's Milan would have never come to be as it's hard to imagine him joining a team not competing for that trophy he wants so bad. When Ibra took over the leadership in Milan's attack and Allegri took over the bench, everything improved and every online discussion about Ronaldinho quickly turned into an exercise in obesity jokes. People were so busy trying to come up with a fresh way to insult him that they forgot the stone cold fact that we wouldn't be where we are had he not contributed the way he did the previous year. Who else was going to be the driving force in Milan's creative department? A chronically injured Pirlo, an old Seedorf or a young Pato? Not a chance. The only player Milan had that could deliver those final passes indeed delivered them and, as unnecessary as he became with the changes brought about in the summer of 2010, it's unfair to completely disregard his contribution from the year before.